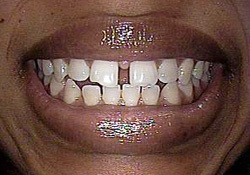 Veneers are thin porcelain shells, like false fingernails, that are permanently adhered to the outsides of your teeth. They are carefully shaped, both to fit your real teeth perfectly, and to give you a perfect smile. 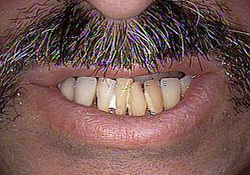 Veneers can make your teeth longer and more even. They will certainly make your smile whiter. Porcelain veneers are relatively expensive, but they are the highest quality material used in cosmetic dentistry. If you have crooked or badly stained teeth that detract from your smile, porcelain veneers could make a huge improvement in your looks by reshaping and whitening your teeth. 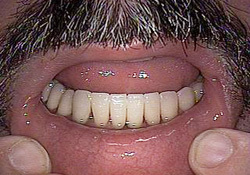 Veneers are one of the most dramatic ways to improve your smile. Because applying porcelain veneers is a special art, you may find that not every dentist is comfortable with this procedure. 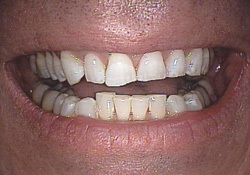 Porcelain veneers and crowns can change your smile. See photos below. During your first appointment the dentist removes a very thin layer of enamel, the hard outer layer of the tooth. (Anesthetic is sometimes not required for this step.) Then the dentist takes an impression of your teeth. This impression is sent to a lab (one specializing in making veneers) which makes your “new teeth” fit your existing teeth perfectly. The dentist will guide the lab to create veneers that reshape your smile. 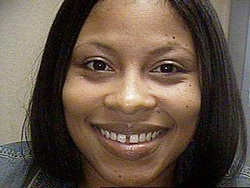 After the lab finishes the veneers you come in for your second appointment. The lab will have made a separate thin porcelain shell for each of your teeth that is being reshaped. They are glued onto your teeth by bonding a thin layer of plastic between each tooth and the veneer. In no time at all you have a new smile. With proper care and maintenance, your veneers will remain in beautiful condition for a long time. 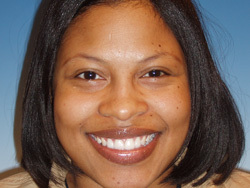 Contact Cleveland cosmetic dentist Steven P. Marsh, D.D.S. 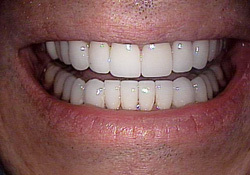 to arrange a consultation about porcelain veneers. 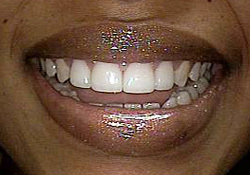 If you are not a candidate for traditional veneers or have sensitive teeth, you may be interested in Lumineer veneers.